laid out on the sidewalk like a sacrifice. The City promised swift removal of the corpse. the raccoon remains remained throughout the day. 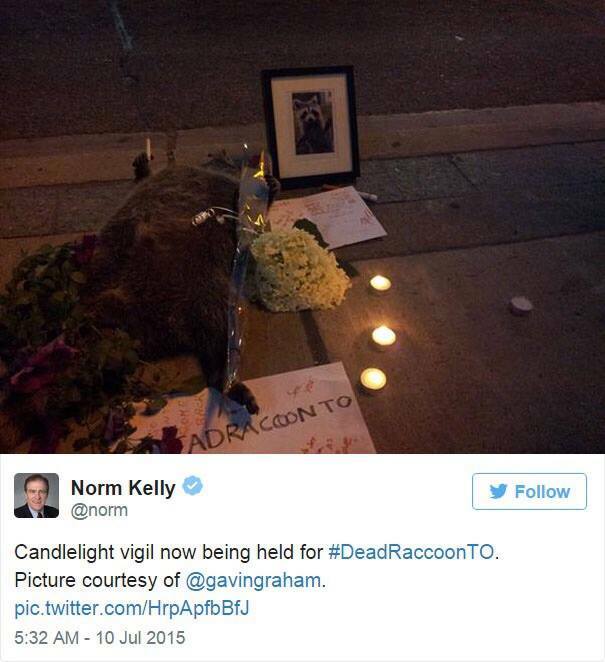 while #deadraccoonto began to decay. This was a social media event in July . The body of a raccoon was found and reported. A spontaneous mock-memorial grew up around it. It was all recorded on Twitter, with even a council member (Norm Kelly) participating. I think it makes a fascinating commentary of social media through parody. Before sunup, I’ve walked hundreds of miles. Every once in a while I encounter a group of raccoons milling along like me and a bunch of friends, garrulous, not exactly sober, loud, still working out slights made during the evening, shoulder-to-shoulder, worried about how their mates will react, and just trying to get home. It makes me feel like a part of The Whole. This poem really spoke to me. Thank you. Down here, the song is “That’s what scavengers are for. We need to save our taxpayers’ money” Every taxpayer who hears that, is ROFLHAO.